This pattern is also available for free on my blog. The downloadable PDF listed for sale contains the full pattern in one printable file without advertisements. 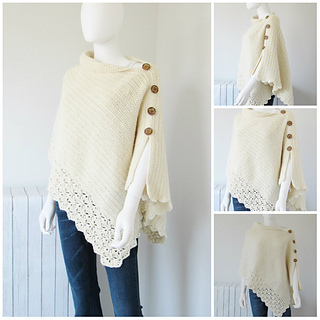 This poncho has a knit-look bodice embellished with a lace hem. It runs from sizes S/M to 3 XL. It is constructed from a simple rectangle and is a very easy pattern. The buttons are only for embellishment and not for closure.